The world of whiskey is a complex maze of grains, flavors, and distillation processes. It is one of the most diverse distilled spirits in the bar. In order to fully understand exactly what whiskey is, we need to look at each individual style. Essentially, all whiskies are distilled from malted grains such as barley, corn, rye, wheat, etc. Whiskey is also almost always (with the exception of moonshine or white dog) aged in barrels for anywhere from just a few years to decades. Four countries produce distinctly different whiskies: Ireland (Irish whiskey), Scotland (Scotch whisky), America (bourbon, Tennessee whiskey, rye whiskey, blended American whiskey), and Canada (Canadian whisky). However, whiskey is made throughout the world. A number of countries, including Japan, are beginning to make a name for themselves in the whiskey industry as well. This wide market ensures that almost everyone will find a brand or style that they prefer. When asked, every whiskey connoisseur has a pointed opinion on which is the best whiskey. Let's explore this diverse liquor in its entirety. We'll look at the basic characteristics of each style of whiskey and how they differ from one another. Considered to be the father of all whiskey, all Irish whiskey must be produced in Ireland. It is often a blend of pot-stilled malted and unmalted whiskies with column-stilled, corn-based grain whiskey. Then again, as in the case of Bushmills, it may also be triple distilled malted barley (a single malt). This complex blend and the fact that Irish whiskey malt is dried in a closed kiln away from fire and smoke, distinguish it from scotch, its closest whiskey cousin. Great care is taken during distillation to keep the temperature low so as not to break the delicately sweet, toasty, honey flavor. Quite often, Irish whiskey is aged in used bourbon barrels or various wine casks for at least three years. As with all whiskey, it can be aged for longer periods and this affects the smoothness as well as the price. The selection of Irish whiskey brands that are available is smaller than most of the other styles. However, the list does include some of the big names in the whiskey business, including Bushmills, Jameson, and Tullamore D.E.W. Yet, you'll also find some hidden gems in the Irish whiskey lineup and will want to look out for labels like Connemara, Greenore, and Slieve Foy. As far as cocktails go, Irish whiskey is extremely versatile. There are, of course, favorites like the Irish coffee and shooters such as the Irish car bomb. Yet, it also works wonders in simple, refreshing drinks like the whiskey and ginger and Irish tea party. By tradition and standard, Scotch whisky uses the spelling for whisky without the "e" and it can only be made in Scotland. The distinct smoky flavor found in this whisky is due to the malt drying process. Part of this is done over a peat-fueled fire that allows the smoke to come in direct contact with the malt. Although the smoky aspect defines scotch, each region of Scotland produces different and distinct flavor characteristics. This is particularly evident in single malts. When choosing a scotch. you will find either "single malt" or "blended" on the label along with an age statement. In the case of blended, the age is that of the youngest whisky in the blend. Single malt scotch is produced by a single distillery. There are around 100 distilleries in Scotland that make single malt whisky and each has their own distinct flavor characteristics and notes. Single malts tend to have more flavor than blended scotch and are used to create those blends. After distilling the malted barley twice in pot stills, a 140 proof spirit called "plain British spirit" is pumped into oak casks and is aged for at least three years. A number of single malts can be aged for 20 or 30 years. It's customary to enjoy single malts on their own or on the rocks, though some cocktails do call for a single malt scotch. Some of the brands to look for include The Glenlivet, Glen Scotia, Laphroaig, and The Macallan. Within this category are some of the most expensive whiskies in the world, though each brand typically offers labels that are affordable as well. The majority of scotch sold is blended and it is preferred for scotch cocktails. They tend to be more mixable with a variety of ingredients and are often sold at a more reasonable price than the single malts. The harder flavors of single malts are softened by blending them with grain whiskies in a cask for several months after each has been aged separately. Scotch blends are an art and each scotch house has its own secret recipe and master blender. While the exact blends are often unknown and very unique, it is not uncommon for 20 to 25 whiskies to be used in a blend with around 20 to 50 percent of those comprised of single malt whiskies. The higher-end blended Scotches will include more single malts, which leads to a deeper flavor. When it comes to blended scotch, there is a great diversity among the brands. Some of the best-known include The Black Grouse, Chivas Regal, Dewars, and Johnnie Walker. You will not find it difficult to discover blended scotches at every price point, from around $20 to upwards of a few hundred. When one thinks of bourbon whiskey, Kentucky, the mint julep , and the old-fashioned immediately come to mind. While bourbon whiskey received its name from Bourbon County, Kentucky, no bourbon is made there today. Yet, bourbon can be distilled in any state of the U.S. Technically, bourbon cannot be produced in other countries. According to a 1964 act of Congress, bourbon must have a mashbill of at least 51 percent corn, with other grain whiskies comprising the remainder. This straight whiskey, known as "America's Native Spirit," must be distilled at 160 proof (80 percent ABV) or less. It is often bottled between 80 and 120 proof. Bourbon must also be aged a minimum of two years in new, charred oak barrels, although it is often aged for four years or more. Bourbon barrels can only be used once, so they are often used by other liquor producers after the first use. It's very common to have tequilas, rums, and other whiskies aged in used bourbon barrels. No blending or additives—except water to reduce it to bottling proof—is allowed in bourbon. Bourbon is one of the preferred whiskies for mixed drinks. In fact, many of the most popular whiskey cocktails call for it. It is a very versatile whiskey and mixes well in everything from a Manhattan to a John Collins. Quite often, when a cocktail recipe calls for "whiskey," a good bourbon will do just fine. You will have no difficulty finding great bourbon for drinking straight or mixing into cocktails. This is a great style for diversity and includes the biggest names in the whiskey industry. Look for names like Maker's Mark, Woodford Reserve, and Wild Turkey. Also, there's the entire Jim Beam portfolio, which includes small-batch favorites like Knob Creek and Basil Hayden's. In America's growing craft distillery scene, bourbon is a favorite. Check out the distilleries in your area because some of the best whiskies produced today come from the smallest operations. Tennessee sour mash whiskey is very similar to bourbon. It also only requires a distillate of at least 51 percent corn, with a maximum of 79 percent. The distinct difference in Tennessee whiskey is due to a unique filtration process in which the whiskey is allowed to slowly drip through 10 feet of sugar-maple charcoal. Known as the "Lincoln County Process," it can take up to two weeks to run one batch through the charcoal. The whiskey is then transferred to a charred barrel for aging for a minimum of two years. It is common to pick up a charcoal taste in Tennessee whiskey, most prominently in the two dominate brands, Jack Daniels and George Dickel. Mixing with Tennessee whiskey is much like making drinks with bourbon. In fact, many drinkers interchange the two in recipes. Yet, due to the fame of Jack Daniels, there are a couple of drinks that are icons of this style and that brand, in particular. The Jack and Coke is the easiest of them all. It is really nothing more than topping a shot of JD (as it's often called) with Coca-Cola in a highball glass filled with ice. The other is the famous Lynchburg lemonade, a refreshing cocktail that mimics a spiked, sparkling lemonade with triple sec and lemon juice. The distinct flavor of Jack Daniels is also a favorite for home chefs. From barbecue sauces to marinades and glazes, it can really add a nice touch to certain foods, particularly meats. Wheat and barley are commonly used to make rye whiskey. However, U.S. law mandates that at least 51 percent of the grain used is rye. Rye whiskey is typically produced in the U.S. and Canada. It is one of the whiskies that is often included in the blends of Canadian whisky. Rye whiskey is most similar in taste to bourbon. There is a notable spiciness and slightly bitter flavor to it that is due to the natural flavors of rye. It makes for a most interesting whiskey that is distinct from all the other styles. Rye whiskey was very popular during Colonial times, especially in the Northeast. However, Prohibition damaged the industry and only a few distilleries continued production after it was repealed. Rye has made a comeback in recent years and this popularity coincided with a renewed interest in classic cocktails, which called for it on a regular basis. Drinks like the Manhattan, for instance, originally called for rye. During the "drought" of rye, however, it became customary to pour a bourbon or Canadian whisky instead. Likewise, if you're looking for an authentic Vieux Carre or Waldorf cocktail, you'll want to pick up a bottle of rye. There are a number of new brands of rye whiskey that are following this trend, as well as a few old favorites that stuck around through the hard times. Alberta Dark Batch, High West, Old Overholt, Rittenhouse, Sazerac, and WhistlePig are just a few of the brands to look for in this category. Some bourbon brands, including Knob Creek and Jim Beam, also offer a rye whiskey. When a cocktail calls for "whiskey" without suggesting a specific style, you may want to choose a good Canadian whisky. It is light-bodied, versatile, and very mixable. Most of the time, Canadian whisky also skips the "e" in whiskey, following in the scotch tradition. Canadian whisky can only be produced in Canada. It is made primarily of corn or wheat and supplemented with rye, barley, or barley malt. It is aged in used oak barrels for a minimum of three years, although most are aged for four to six years. Almost all Canadian Whiskey is a blend of various grain whiskies of different ages. It is a complicated process that requires a master blender to create the smooth Canadian whiskies that we taste in the bottle. Canadian distillers are known for their blending skills and can rival that of the best scotch blenders. There is no shortage of Canadian whiskies available on the shelves of liquor stores. Canadian Club, Canadian Mist, Caribou Crossing, Crown Royal, and Forty Creek are just a few worth tasting. You'll also be happy to know that brands in this style tend to be among the most affordable whiskies on the market. When it comes to cocktails, nearly any drink that uses whisky is a good candidate for a pour of a smooth Canadian. 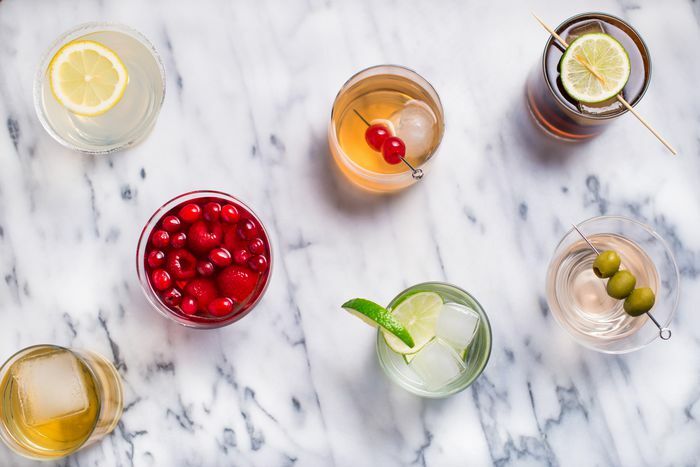 It can work in modern as well as classic cocktails, with fruits, in sweet drinks, and tall, refreshing highballs. When we say a Canadian blend is versatile, we really do mean it. A recipe such as the Canadian cocktail is a perfect introduction to the style's mixability and it's similar to the Canadian Club sour. For something that's fun and unique, try the mango iced tea recipe with a 12-year-old whisky. 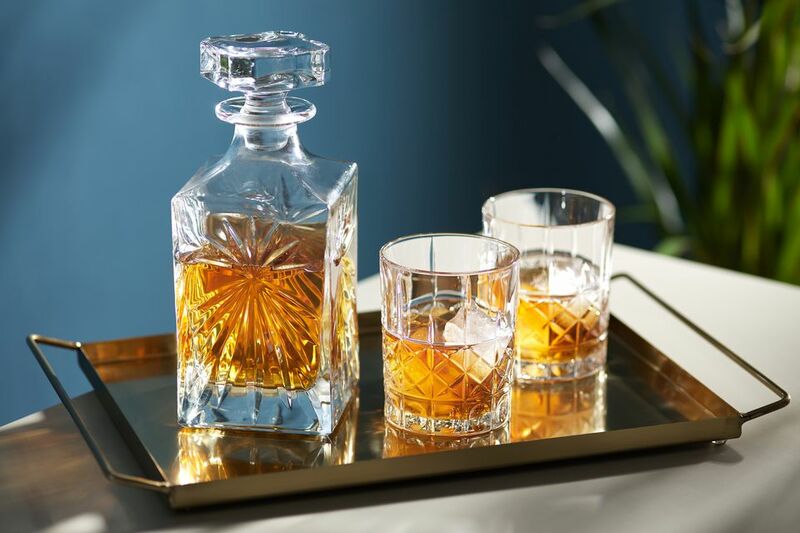 Like blended scotch, American blended whiskey is a careful selection of straight whiskies and grain spirits combined to create one distinct spirit. This is another good whiskey option for cocktail recipes that don't specify a style. A blended whiskey must contain at least 20 percent straight whiskey. Premium brands may include as many as 75 different straight whiskies and grain neutral spirits. This art of blending produces a balanced, rich, light-bodied whiskey, each with its own character. The brands are too numerous to list and often include American-made whiskies that do not fall into the rye or bourbon styles. That's because the brand's production doesn't prescribe to the labeling requirements of either of those for one reason or another. There are a number of "straight" American whiskies available as well. This means that they are not blended, but go straight from the still to the barrel. We're seeing much more of these thanks to the craft distillery movement in the U.S.
Japan, Taiwan, Australia, New Zealand, England, and even India and South Africa are becoming more widely known for making some impressive whiskies. Many of these either have no set regulations to designate styles or they are very specific to the country. It is very interesting that many of these worldly whiskies are single malts. Japanese whisky producers are specialists in creating brilliant single malts and they are often compared to scotch in taste, style, and quality. As more whiskey is produced in countries not typically known for doing so, it will be interesting to see what happens. It is certainly something for whiskey connoisseurs to be excited about because it gives us new expressions to explore. For the most part, these whiskies are versatile. Try a new bottle out in your favorite cocktails and see how it works. This is a category that is completely open for experimentation for the simple fact that it's relatively new. Whiskey is also a fantastic base liquor to add flavor to. It is not as common as flavored vodkas or rums, but flavored whiskies are around and are rather useful and fun. There are a handful of cocktails that call for flavored whiskey of some sort and they are quite delicious. Apple whiskey was a rather popular ingredient in classic cocktails and it was quite popular in the days before Prohibition. There are a few brands—primarily small distilleries—that continue to produce true apple whiskey. The New York-based Leopold Bros. is certainly one to check out. As infused distilled spirits become more popular, a number of distillers are venturing into this realm with their whiskies and the options continue to grow. Flavored whiskey (like vodka) can be tricky, though. Some producers use unnatural ingredients to flavor the whiskey while others prefer a clean, true flavor from natural ingredients. Most flavored "whiskies" are technically liqueurs because of the sweeteners and flavoring ingredients used. In the case of bourbon, it cannot technically be labeled "bourbon" after any flavoring is added (even without sweeteners). It is instead deemed "whiskey" though sometimes you'll see something to the effect of "bourbon liqueur" on the label. Making your own flavored whiskey is just as easy as any other infusion. All you need is a bottle of whiskey, the flavoring ingredient, and a little time. It's quite fun and, given the different flavor profiles available in whiskey, the possibilities are endless. Do You Really Know Your Gin?